In Brief: Follow a path through a scenic gully into an isolated and mostly abandoned old village; continue through the hills to find a short stretch of very old Great Wall. After the hike, take a stroll through the streets of Yongning Town, a countryside town with a long history. Because this hike is mostly flat it’s fine for fairly active kids. If you’re not sure about the suitability, please get in touch with us. The hike begins with a nice long, flat walk up the Cypress Wells Canyon. To begin with, the walls of the canyon are high and steep, but after a while the canyon starts to open up, and we’ll begin to get views of the surrounding mountains. About midway through the hike we’ll reach a small, mostly-abandoned village. On previous visits we’ve only seen a few old gaffers about. Many of the houses are empty, and from the looks of things they have been empty for quite some time. Somewhat out of place amongst the stone and mud-brick houses are a set of strange hexagon-shaped shelters – perhaps the remnants of an experiment in tourism. We’ll have a break and take time for lunch and a look about the village, and then continue, following a trail up through a pine forest, heading for a stretch of Warring States-era (476-221 BC) Great Wall. The wall continues up and over the ridges on either side, but is not really in good enough condition to make an enjoyable walk. Instead of following the wall, we’ll head down a valley trail and then walk out to the road where the bus will be waiting. After a Beijing Hikers-style picnic at the bus, we’ll board and drive on to Yongning Town for a quick look about before heading home to Beijing. What’s there to see on this hike? A short stretch of ‘Warring States’ era (476-221 BC, before the Qin Dynasty) Great Wall, an old village with abandoned houses, and mountains and forests. A big tower in Yongning Town, and a strangely-sited Catholic church. A set of photos from the long but easy trail through Cypress Wells Canyon. Thirteen photos from an autumn hike through Cypress Wells Canyon, passing an abandoned village and Great Wall on the way to the end. Photos from our hike through Cypress Wells Canyon and post-hike visit to Yongning Town. Our Cypress Wells Canyon hike follows a trail through a canyon into a bowl-like valley in which there are several abandoned villages. 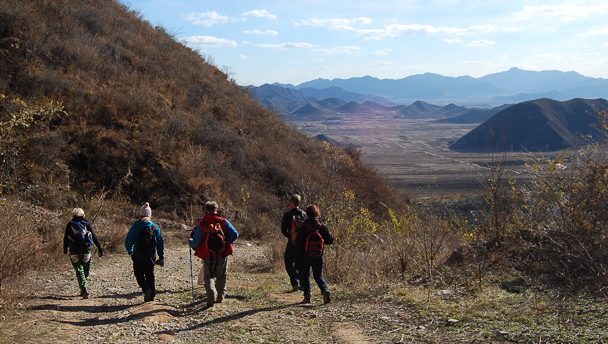 The hike continues up to a ridgeline where there’s a stretch of broken-down Great Wall to look at. Click through to see photos of hills and cliffs, Great Wall, and hikers. The Cypress Wells Canyon hike is a nice long hike with a short, steep ascent up through the woods and bush. Near the end of the walk, we pass a broken down section of the Yan Great Wall. Click through to see photos and a short writeup.